Sleaford Town manager Jamie Shaw has called on his side to show a ruthless streak if they want to join the top sides in the division. Town played 75 minutes with 10 men after Ryan Oliver’s early dismissal and were beaten 2-0 at home by UCL Premier top-four side Holbeach United on Saturday. But Shaw was pleased with his side’s endeavour and believed there was little to separate them from a side which has finished in the top six in three of the last four seasons. “The result was frustrating, but it showed that we’re not far away from the top teams,” Shaw said. He added: “It was a typical non-league local derby where quality was replaced in the main by effort and endeavour. The high-flying visitors started better and were ahead thanks to a sixth-minute opener before Oliver’s dismissal gave Town a mountain to climb. “I felt Ryan was a touch unfortunate as there didn’t appear to be much, if any, contact,” Shaw said. 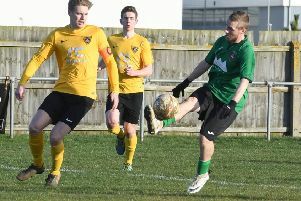 The numbers were evened up just before the half-hour when the Holbeach right-back was also sent off for a late tackle. Town grew into a first half of few chances, but were indebted to Archie Moyses’ clearance off the line just before the break. Both sides continued to probe after half-time, but it was Holbeach who scored the decisive next goal. Start made a fine stop, but from the ensuing corner, poor defending allowed the visitors to double their lead. Town remain 13th and will look to hit back on Saturday when they travel to ninth-placed Leicester Nirvana who were beaten 5-0 at strugglers Boston Town last weekend and are without a win in five matches. Kick-off is 3pm.